Be the first to know all about the Philippines with AirAsia! Explore the well-preserved culture and stunning architecture of the Philippines’ building or head over to the Philippines’s street food market to enjoy the glorious Filipino cuisine for food lovers out there. If landscape photography is your passion, head over to the Philippines’ beautiful islands and white sandy beaches. Not only that, you can also be part of their annual fiesta and special events with your friends! Can’t wait to explore the Philippines? Check out AirAsia travel3sixty new the Philippines E-guide and you can download it for free for your guide to what, who, where, how and why of The Best of Philippines! Places of interest: Clark, Manila, Kalibo, Davao and Puerto Princesa. A 24-page travel e-guide e-book about Philippines. 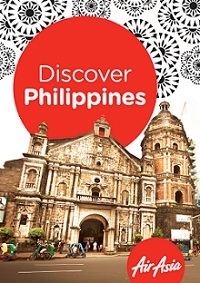 Download this FREE Travel E-Guide - Philippines (or via AirAsia travel3sixty) now! Remember to LIKE & SHARE this AirAsia travel3sixty love with your friends ya!